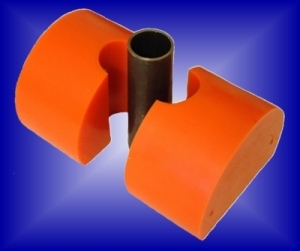 Benoil has recently extended the range of stripper rubbers to include radial stripper rubbers. These are available for a range of tubing sizes. Units for smaller tubing - 2"CT and smaller - can be supplied with a serviceable centre packer or insert. The inserts are 3.50"OD so CT larger than 2"OD makes for a marginal PU thickness. Changing out inserts has a unit cost benefit over the paired halves of the radial packer, but for larger tubing it is much safer to use the all-in-one radial packer. We supply a variety of radial stripper rubber units from Low Temperature/Low Pressure through to High Temperature/ High Pressure.